The Smartphone market has been flooded in recent years with a whole slew of phones that do everything a phone shouldn’t be able to do. When cameras came out on phones, which was a huge step forward. Next came the internet browser, then the email client, and then the list got so long that it became impossible to even keep track of where the phone function was. 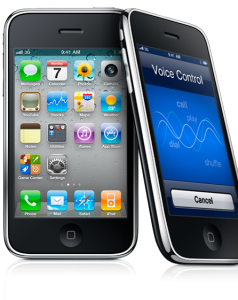 The new iPhone 3GS can be seen as either a huge leap forward over its predecessor or it can be seen as just another “update” to the phone that already did everything you could ever want a phone to do. From the hardware side of things, the new iPhone doesn’t really look that much different from the previous version. The sleek and shimmering curves still glisten in the sun and they hold the device together until you drop it and it’s finished forever. They’ve added a new three megapixel camera to the phone that, if I’m honest, takes some very fine pictures. Phone cameras always lacked quality, and it was expected that this one would be no different. The picture quality is actually, in my opinion, superb for a phone and if you’re looking to ditch your small pocket camera for this, you may very well be able to. But, if you’re a camera junkie that needs fine quality pictures all of the time, the iPhone camera, as said by the Gizmodo team, isn’t a “mindblowing revolutionary step.” It’s also capable of taking video as well as stills which helps if you’re caught in a moment that you need to really remember. The inside of the phone is also slightly different than the previous generations. They’ve boosted the CPU speed up to a rumored 600Mhz from about 450MHz and doubled the RAM to 256 megabytes. While all of these numbers are fine and dandy, it’s not until they’re put into action that you notice anything. Application load times and scrolling are both much faster, but as Joshua Topolsky from Engadget puts it, none of us are sure if the speed will last or if it “will begin to bog down after months of use and heaps of data.” It’s obviously an upgrade over the previous phone because we can see the speed changes, but in all honesty, and I think you’ll agree with me, it doesn’t do a whole lot. Just like a new car that has a few more horsepower than your last one, it may be hard to go back. But your phone is already doing more than it should, so why spend the extra cash when you just don’t need it? Apple finally introduced MMS messaging to their phones as well, which is a long welcomed change over the regular SMS messages that were previously possible. It seemed foolish to have the ability to take pictures with your phone if you couldn’t ever do anything with them. And because Apple has always been on top of the “media management” field, the new iPhone boosts a voice recognition system that not only lets you call someone without having to dial their number, but also choose a song, artist, or album by simply telling the iPhone to play it. While the old menus weren’t exactly difficult to navigate, voice recognition does help if you can’t quite reach your phone. Apart from a slightly snappier interface, a few minor hardware updates that let you take better pictures and the ability to cut and paste, I don’t see too much in the new iPhone that would make me want to spend another $300 on a product that’s almost identical to the one I own. Before rushing out to buy the latest and greatest, I’d like to wait for the next generation to see what kinds of leaps and bounds they can make in terms of hardware and software updates. For now, my old iPhone is just fine and I’m almost positive yours is too. Hardy is a free lancer writer and content builder of many technology sites and currently he is analysing best cell phones in market.